Choose the practical luxury of laminate flooring and enjoy the style, versatility, and affordable rates of your new floors. When it comes to your home or business, it’s important to have flooring that’s both attractive and functional. Exquisite flooring can set the mood for your entire space, whether it’s big or small. Because laminate tile and laminate wood flooring are so visually diverse, you can take your pick of wood, stone, or replicated tile, allowing you to create a truly personalized interior. We are ready to help you bring your design vision to life. Luxurious flooring adds dimension and aesthetic design opportunities to your interior décor. It can mimic the appearance of the patterns, grain, and warm tones of real wood, stone, or brick flooring. We offer a diverse selection of laminate flooring that offers both form and function for the discerning homeowner. Our experienced team can help you choose the right look to add charm and just the right shade of chic to your home. There are many advantages to having laminate tile flooring. From the blue-gray hues of natural stone to the white sheen of some traditional tiles, our selection offers virtually any style you could hope for. All are available in laminate. With top name brands like Mannington, Mohawk, Shaw and Floorcraft, no matter which product you choose, you can depend on the materials to deliver exceptional quality. When you invest in new flooring, your flooring is an investment in your property. Modern innovations in laminate production allow our supplier to provide premium laminate selections to residential and commercial clients who want a luxurious look at an affordable rate. As a result, we believe it is our duty to provide our customers with high-quality flooring and affordable laminate flooring installations. To help you sort through your options, our sales and design staff will work closely with you to determine your particular needs. We are happy to talk with you about your budget, personal style, and the type of environment your new flooring will be part of. We can select samples that we believe will work for you so that you can view them in person. Our designers then show you what the different options will look like in your home or office space so that you can be more confident about your final purchase decision. If you have hardwood in your living space, and would like to continue it into your kitchen, bathroom, or another space, laminate wood flooring may be your best solution. That’s because laminate is not porous like natural wood. So, it is excellent for high-moisture areas, because it does not warp or grow mold and mildew. And with the quality design choices we have available, you can pick floors that match your existing hardwood. Even if you don’t have hardwood elsewhere in your home, laminate wood flooring can add a touch of elegance to any living or office space. Laminate isn’t just about being attractive and affordable—it also has many functional characteristics. Because of its nonporous surface, it is a breeze to clean. Simply use a mild cleaner to keep it spotless. Stains are a thing of the past with laminate floors. Water, coffee, juice, and other liquids will sit on top of the surface of your floors and wait to be wiped up instead of staining the layers underneath. 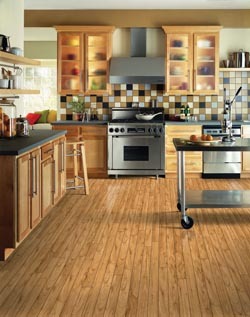 With our high-quality laminate, you can keep your living area looking great for years to come. When you visit us, you won’t only be impressed by the new laminate floors we’re ready to help you create. You’ll also be impressed by our commitment to customer satisfaction. Our team of experts will work with you throughout the entire process, making it easier than you anticipated get the floors of your dreams. If you’ve never considered laminate floors before, or you have not heard details about the product, we can show you samples and give you all the information you need to make an informed choice. We’re certain this attractive and durable flooring is the best option for your home or business. Laminate is an exceptionally versatile synthetic flooring material. It is engineered and constructed in four layers. Each layer serves a unique aesthetic or practical purpose, and this multi-layered structure offers incredible durability. Though each layer plays a pivotal role in protecting the integrity of your floors, the clear top-coat is the primary protector against fading and stains. The design layer contains a high-resolution image of the flooring it is meant to imitate, such as wood grain, stone, or ceramic. This allows the laminate to replicate the look of almost any other flooring material. Thanks to this material, buyers today have the option of affordably furnishing any room in their home with any flooring aesthetic they want. The inner core is composed of plastic resin that keeps the laminate stable and flat. The backing is designed to be a moisture barrier that protects your new floor from becoming warped or cracked. This makes laminate an excellent flooring solution for moisture-prone areas of your home. Don’t miss out on this premium flooring that withstands the demands of daily use and even heavy foot traffic. Once you’ve chosen your material type, we’ll help you sort through any other details. You also have a great deal of design flexibility in choosing the color, pattern, size, and brand that you want. Whether you have laminate wood flooring installed throughout your home, or laminate tile added to create a unique look in your kitchen, bathroom, or foyer or living area, we have everything you need. Our professional installers ensure the longevity and beauty of your new floors by providing high-quality workmanship on your installation. You can rely on our experienced experts to ensure the performance of your new flooring. By offering superior laminate installation services, we are able to make certain that your materials are performing optimally and to their fullest potential. With years of practical experience and training, you can rest assured there will be no installation-related issues that may lead to aesthetic or functional flaws. We are so confident in our team, in fact, that we offer a Lifetime Installation Guarantee. It covers any problems which are installation-related for the entire life of your flooring. Contact us today to find out more about why laminate is right for you. We proudly serve customers in Johnstown, Somerset, Latrobe, Derry, and Greensburg, Pennsylvania.